Filter Pumps- need to be able to operate for long periods of time without blocking, they also need to be able to pass solids to the filter to enable them to be removed from the pond. As they are part of the life support system for the pond they need to be very reliable. We carry a variety of air pumps, aeration systems, and air pump accessories from the leading manufacturers such as Airmax (Air Max), Alita, Aquascape, Hakko, Laguna, Pondmaster (Pond Master). or for questions call Toll Free 888-766-3725 / Maryland 410-803-1688. 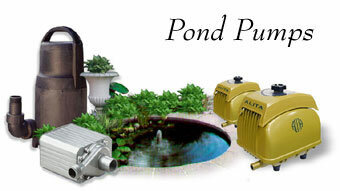 Pond Pals at Hemphill's Garden and Aquatic Center for all your pond and water garden supplies.